I recently had the chance to sit down with Laura and Andrew, who, along with Laura’s brother Chris, will be opening Stillwell Beer Bar soon in Halifax. Located at 1672 Barrington Street, the bar will focus on local craft beer (to steal a line from Rattle N Hum in New York, “No Crap On Tap!”), paired with fresh, local, seasonal food. I had read lots about the bar and owners Andrew, Laura and Chris from a few articles published in the summer (from The Chronicle Herald and The Coast, to name but a couple), but I wanted to delve into the beer side of things (that’s what we’re all about here, after all). I first asked Laura to tell me a bit about her history with beer: how did they get into craft beer? Andrew and I met working at The White Horse on Parson’s Green, a pretty famous London beer bar with critical acclaim. (Andrew: Imagine discovering beer at a bar with 8 English casks, St Bernardus and co. on tap and a yearly American Beer Festival featuring Stone on draft). A job working there meant weekly training, typically on beer though sometimes wine and spirits – brewers and reps would come and give a breakdown and tasting on their brands and it really opened our eyes to the beer world. We also had the opportunity to do staff training in Brussels, touring local bars with reps tasting their wares, and touring Cantillon. We also attended Oktoberfest – one of the best times I’ve had in my entire life. Chris states an interest in beer sparking in his early twenties when buying growlers of Propeller and noting that, hey, this stuff is way better than Faxe (ha!). I then asked about the impetus behind Stillwell: What brought you (back) to Halifax, and why open a beer bar? Laura: Chris and I are originally from Halifax, though have been living away for a few years – we’ve seen the craft beer scene growing and growing every time we came home, but hadn’t yet seen the type of bar we would see in other cities – a beer bar to celebrate the best of local brews, and fantastic beers in general. Halifax has such a rich history in beer, and I think every city like that needs a home to showcase great products – we’re really excited to be setting up a place that brings together our favourite elements in a bar, and our favourite beer. 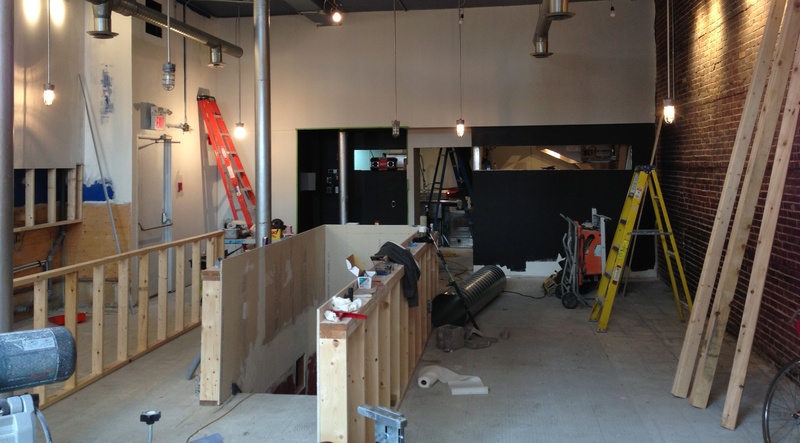 When I visited mid-September, lots of work was still taking place, including building the bar top. 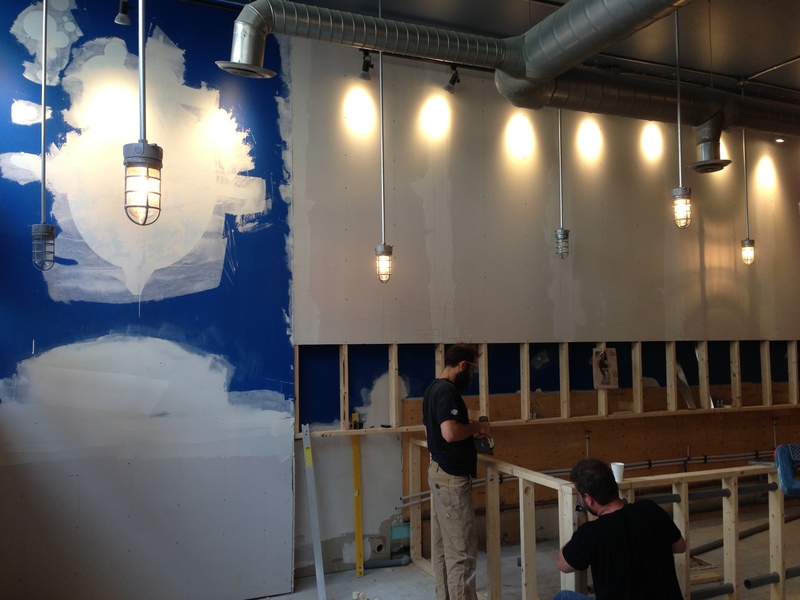 It will feature 12 rotating taps, and 3 beers on cask. They will be highlighting the best of beer from the Maritimes, with a strong focus on the non-mainstream and one-off experimental beers that brewers are putting out. They hope to expand their reach further West and South as well, with great beers from great breweries in Quebec and Ontario, and maybe even Maine. With so many new and upcoming small breweries in the area, I’m sure they will be well stocked with a great variety of interesting and exciting beers not available elsewhere. In addition to the casks and kegs, they will stock about 30 different bottles, again from local and further afield, to complement the draft selection. From Andrew’s experience working at barVolo in Toronto, they will be sure to have something for beer lovers of all stripes and persuasions. Food-wise, the focus will be on small bites, rather than large format meals, and will be prepared, or paired, with the beer currently pouring, and made with an eye for local and seasonal ingredients. This will allow patrons to try several different tastes and food experiences while they enjoy their beer. The layout of the bar will have a couple of large communal tables, and plenty of stools and ledges, encouraging the community aspect of enjoying a pint with friends, old and new. They’ve got a sound system in place, being fed by a vinyl player right by the bar, going for good, not loud, music. To stay up-to-date with the bar’s progress, follow them on Twitter and Facebook, and check back here, as we’ll be sure to let you know when they open. Welcome to our neck of the woods, Stillwell, we’re excited to have a seat at that bar soon!